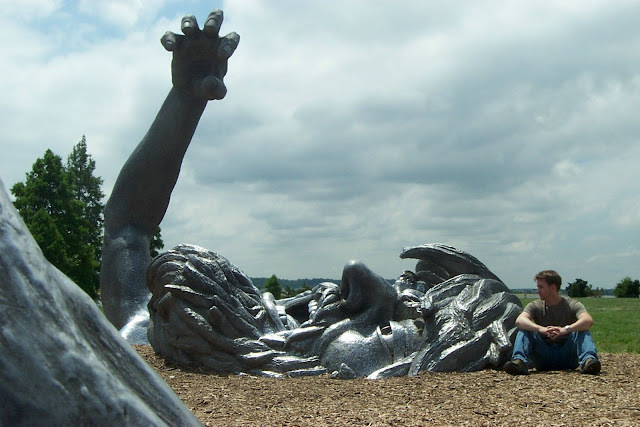 UPDATE: Since writing this piece, The Awakening statue has been moved from its spot at Hains Point in Washington, DC, where it has struggled valiantly to free itself from the earth for three decades. Now, it has been re-buried just down Route 295 at the National Harbor in Prince George’s County, Maryland. See pictures from my visit to the new location here. June 1, 2007 — Washington D.C. is absolutely pimpled with monuments and statues, but you have never seen its most remarkable one. No, I mean it, you really haven’t. Maybe because it’s lost in that aforementioned panoply. Maybe because it has no ties to American history whatsoever. Maybe because it’s a bit off the beaten (all right, abused) tourist track. Maybe because it was created by a guy whose artistic credibility extends only as far as being bored and rich. I’m going to say it again. 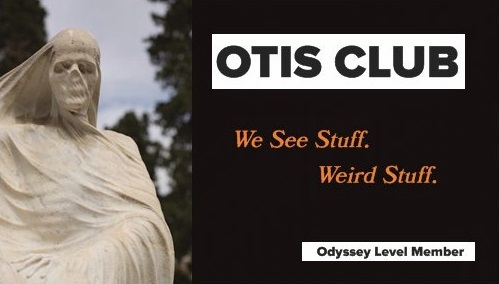 You have not seen this statue. What? Oh, you watched that Sandra Bullock movie The Net? Well, okay, then, you have seen it. 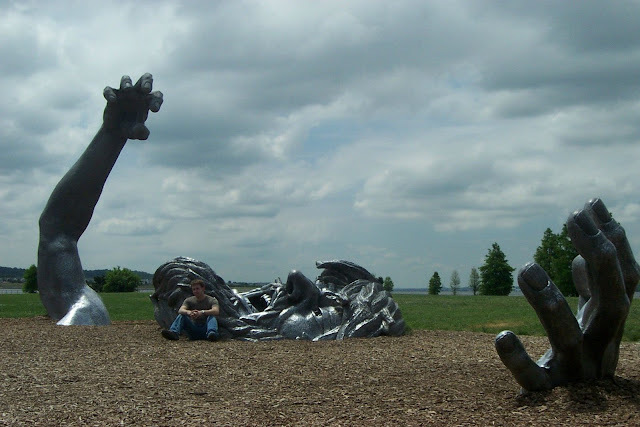 For those of you with higher film standards, the sculpture’s called The Awakening, and it’s currently entrenched at Hains Point, the tip of a small peninsula known as East Potomac Park somewhat near the Jefferson Memorial in D.C. I say currently because there have been rumors since 2001 or so that the sculpture would be relocated elsewhere. As of early 2007, though, the sculpture is still there. Also, just to warn you, I’m having trouble knowing when to appropriately use the terms sculpture and statue in this article, so I will be switching randomly between the two throughout. The Awakening is a 100-foot-long aluminum sculpture in five separate parts depicting an anguished bearded giant either being swallowed by the earth, emerging from it, or being trapped in it (that’s how you know it’s art…because it’s vague), all in such a way that it implies that the rest of the statue is underground. You can’t see his knee or foot in these pictures, mostly because I don’t have those kind of fetishes. I found out about this work in a roundabout way. The sculpture was cast by J. Seward Johnson, Jr., of the cleanly coiffed Johnson & Johnson clan. He happened to own (without even really knowing it, I think) a tiny industry magazine for which I used to work. Johnson’s artistic work seems generally uninspired, mostly life-size bronze casts of people doing various uninteresting things, but I’ve little problem sifting through a lifetime of mediocre work just to see something like this piece. According to Sandra Bullock’s ’net, it was erected in 1980 for some sort of sculpture exhibition. It was only supposed to be a temporary display. That's pretty much its whole story. The Potomac River and Washington Channel backdrop The Awakening, and close on the opposite bank of the Potomac is Ronald Reagan Airport, so it’s a picturesque spot for the placement of a sculpture for a lot of reasons. It’s kind of a long walk from the Smithsonian stop on the orange line of the Metro, but still do-able. And by do-able I mean that I did it. You can also easily drive there (relatively…it is in D.C. after all). Some parking spaces are located nearby, and you can always just park on the side of the road near the sculpture. You’ll probably have to dodge a few kids who use it as a playground, even though there’s an actual playground within hop-scotching distance. Parents like to snap pictures of them sitting in the giant’s palm or sliding down his shin or emerging from his maw (yes, maw); however, it’s much less crowded than any other monument in D.C., by a factor, I’d say, of about a billion. I went on an early Saturday afternoon in 2003 or 2004, and only had to wait 20 minutes or so to have some solo time with the sculpture. The one aspect of the sculpture that I’d change if I were a bored healthcare scion is to install some grass around the various pieces of the statue to heighten the illusion of its partial burial instead of the mulch-type substance that surrounded the statue in an artificial circle when I visited. That bare gripe disappears when it snows or floods, when it becomes even cooler. I read somewhere that cars have hit the statue once or twice. That makes me incredibly happy. Obviously not because I hate the statue, or even cars really. It just seems an awfully heroic move to me.